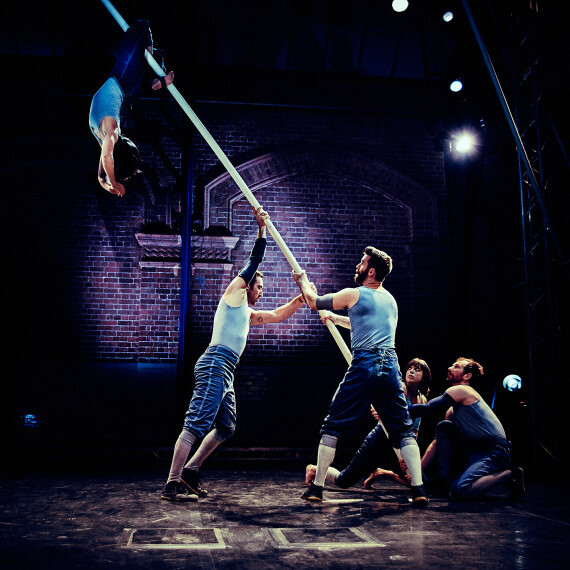 WE ARE AN AERIAL THEATRE COMPANY WHO COMBINE CIRCUS AND VISUAL THEATRE TO MAKE WORK THAT IS ARRESTING AND ENTERTAINING. WE SPECIALISE IN CREATING PHYSICAL THEATRE ON ORIGINAL PIECES OF AERIAL EQUIPMENT AND CREATE STORIES FROM THE VULNERABILITY, TRUST AND RELIANCE THAT EXIST BETWEEN PEOPLE IN THE AIR. Rather than paint the circus performer as a superhuman character capable of impressive feats we make work that draws on the human and the real, where the characters go through recognisable experiences, emotions and conflicts which the audience can identify with and relate to. Our shows are exciting and moving and we feel that we’ve achieved our aims when members of the audience have said to us “I wanted to come on stage and do it with you”. The Company was formed in 2004. We all met while studying at Circomedia, Academy of Circus Arts and Physical Performance in Bristol. In spring 2006, Turtle Key Arts became our producers.